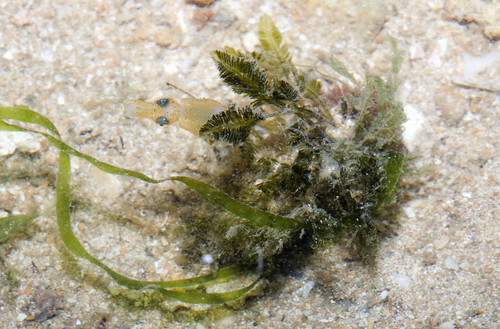 Pygmy squids popped up on each of the nearly two consecutive mornings spent on Pulau Sekudu last week, when the tides fell before dawn to expose a broad, broken pool of grass and sea lettuce around shapely rocks and a tongue of sand. The cephalopods float in a foot or less of water, slivers of menace over gangs of shrimp with sky-blue eyes and gobies with few quibbles and no qualms about life in the shallow end. Despite their size, Idiosepius are conspicuous when on the hunt, alternatively blanching and bursting with pigments of excitement as they scour the intertidal terrain for careless mysids and decapods, and celebrating every catch with chromatic eruptions that accompany the demise of a benthic prowler. At times, the squids appear almost opportunistic, revelling in beams of artificial light to grab a dazzled meal; others bobbed and puttered until they caught sight of a strand of weed, manœuvred towards a frond in need, and stuck themselves to the filaments. The point of attachment is the dorsal end of the mantle, where special glands, unhindered by subdermal musculature, secrete adhesives that secure the squid to botanical surfaces. Getting a grip took more than a few seconds, as the squid probably had to wait for its gunk to set before it could hang loose from the leaf. 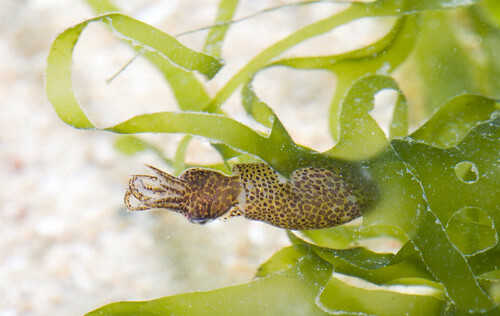 Sticky organs are not unique to Idiosepius; some Sepia from South Africa have ventral pads that allow them to adhere to rocks and piles in turbulent waters, while Nautilus, which lack the suction cups of other cephalopods, have glands on their tentacles that help the animals to capture prey, copulate and hold on to a substrate. Idiosepiids, which are associated with seagrass flats and mangrove creeks, probably use their sticky powers to combat tidal drift that may wash them into unfriendly depths. Letting go when hunger looms and mates beckon, on the other hand, is less a lesson in chemistry than a purely physical impulse driven by a need to stay in the zone without committing to a sessile existence in a sea of shelly fish and wholly indisposed to brief but all-too fleeting detachments.